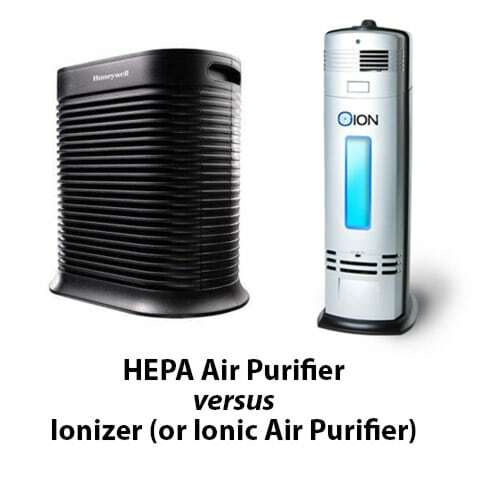 Are you trying to find out what the difference is between a HEPA air purifier vs Ionizer (or Ionic air purifier)? While both products clean the air from impurities, they operate in two completely different ways. Depending on why you want to get a home air cleaner in the first place, will determine if you should get a HEPA air purifying device or Ionizer. 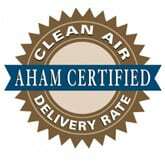 So keep reading to find out what each type of product does and how it purifies the air. The major difference between an Ionic air purifier vs HEPA air purifier is how each product removes impurities from the air. A HEPA air purifier operates by sucking air into the device through a dense, physical filter that traps airborne contaminants. It then pushes out clean, fresh air into the room. This process continually repeats while the product is turned on and keeps the room free from contaminants. If new impurities enter into the room, like smoke or dust, the device will eventually pull these particles into the filter and prevent them from returning to the room. An Ionizer operates by sending out electrically charged ions into the air that bond with harmful impurities. Once a bond is made, these particles become too heavy to stay in the air. This results in the contaminants falling onto the floor, or if it is equipped with a collection plate, being attracted to this element and later being cleaned off by the homeowner. The advantage that a HEPA air purifier vs Ionizer has is that it actually traps the airborne contaminants. With an Ionizer, there is always a chance that the particles can be kicked back up into the air when people walk through the room. This results in a never-ending cycle of impurities being removed from the air and returning. Products that include a collection plate are better at ending this cycle but are not perfect. Since a HEPA air purifier uses a physical filter, the maximum area it can cover is not as wide as an Ionizer. In fact, the largest space an air purifier with a HEPA filter can purify that we’ve seen for sale is 1,560 sq. ft. It’s called the AIRMEGA 400. This is fine for most home applications, but for a large business space this may not be sufficient. To find out if this device will work for you, visit our best air purifier reviews page to read more about it. As a comparison, we’ve seen some Ionizers that purify an air space up to 3,500 sq. ft. That’s a huge space and can clean the air of even the largest home or business. The Living Fresh Sky1057 falls into this category. You can find out if this is a better choice for you by visiting our best ionic air purifier reviews page to see all the details on this product. 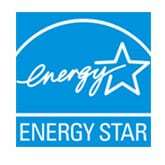 In many ways a HEPA air purifier is a more advanced technology, but it does come with a cost. In fact, HEPA air purifiers are most always more expensive than Ionizers. There are some Ionizers for sale that cost as little as $50. The cheapest HEPA air purifier we’ve ever found, and is worth the investment, is $150. So, you’re going to have to spend a little more money to get a HEPA device. That being said, a HEPA device also costs more to maintain. Since this product uses a physical filter, it needs to be replace on an annual basis, if not before. Since, Ionizers don’t use physical filters, except for ones that include a collection plate, there are not yearly maintenance costs. If the product includes a collection plate, this is washable and reusable for the lifetime of the product – saving you yearly replacement costs. Finally, the design and style options are very limited in Ionizers. What you’ll find mostly are thin, vertical units that can be placed in a corner or small, compact square units that can be place practically anywhere. Most Ionizers have a modern design and some are almost futuristic looking. And, all of the ones we have seen must sit on the ground or on a table. We have never seen a wall mountable product, which limits your options. HEPA air purifiers on the other hand come in all shapes and sizes. You can find a product that matches the decor of your room if you look hard enough. Some products are wall mountable too, which means you can place it practically anywhere inside your home or business. You’ll also find a variety of colors and styles with HEPA air purifiers. They just have so many more options available to you as a consumer than compared to Ionizers. What is a UV light air cleaner? What is an Activated Charcoal Filter used for? What does a pre-filter do? How does a smart air purifier work?